Earwigs make up the insect order Dermaptera, found throughout the Americas, Africa, Eurasia, Australia and New Zealand. With about 2,000 species in 12 families, they are one of the smaller insect orders. Earwigs have characteristic cerci, a pair of forceps pincers on their abdomen, and membranous wings folded underneath short forewings, hence the scientific order name, "skin wings." Some groups are tiny parasites on mammals and lack the typical pincers. Earwigs rarely use their flying ability. Earwig are hemimetabolous, meaning they undergo incomplete metamorphosis, developing through a series of 4 to 6 molts. The developmental stages between molts are called instars. 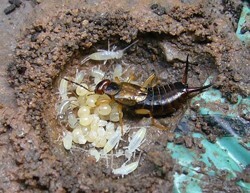 Earwigs live for about a year from hatching. They start mating in the autumn, and can be found together in the autumn and winter. The male and female will live in a chamber in debris, crevices, or soil 2.5 mm deep. After mating, the sperm may remain in the female for months before the eggs are fertilized. From midwinter to early spring, the male will leave, or be driven out by the female. Afterward the female will begin to lay 20 to 80 pearly white eggs in 2 days. Some earwigs, those parasitic in the suborders Arixeniina and Hemimerina, are viviparous (give birth to live young); they would be fed by a sort ofplacenta. When first laid, the eggs are white or cream-colored and oval-shaped, but right before hatching they become kidney-shaped and brown. Each egg is approximately 1 mm (0.04 in) tall and 0.8 mm (0.03 in) wide. Contact Knott's today for solutions to your earwig infestation!